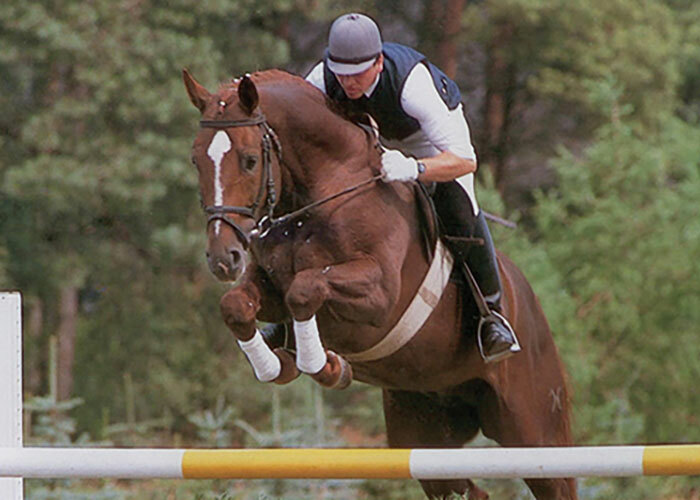 Sire Eiger 1 turned out to be one of the most important producers of show jumpers of the present Hanoverian breed. He brought seven approved sons among which one finds the Celle state sires Espri, Edinburgh and Evergreen and Elute. Some of his progeny easily called to mind in show jumping circles in the 80’s was Easy Jumper, and Efendi 48, Esprit, and Eibe 16. 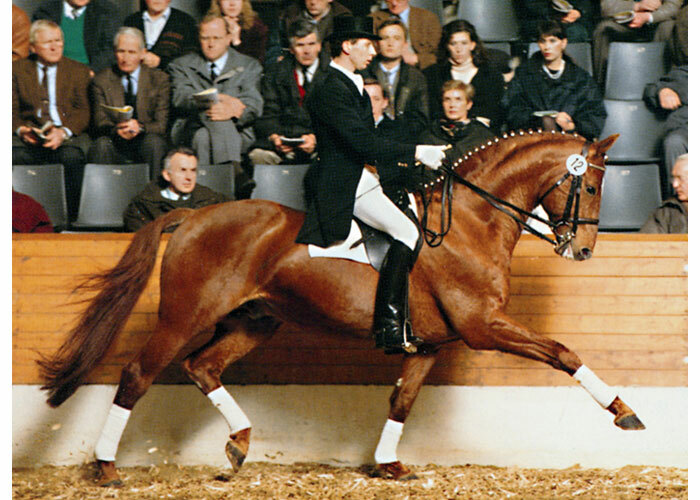 Eiger not only produced show jumpers but also dressage horses, eg Eiswind 13 and Empire 58. Dam Diplomatin is marked by the sire Diplomat, the so called king of the show grounds who won both the federal horse show and the DLG show. He is known for giving his progeny both outstanding movements and remarkable jumping capacities. Espri combines the quality of Eiger 1 with the dressage and jumping ability of Duft and Lugano. 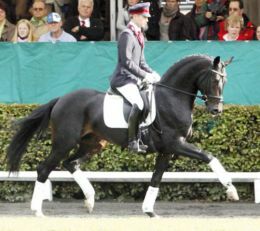 The third generation sire Lukas, who for his whole life stood at stud in the Achim-Thedinghausen breeding area is considered the best son of the performance producer Lugano 1. 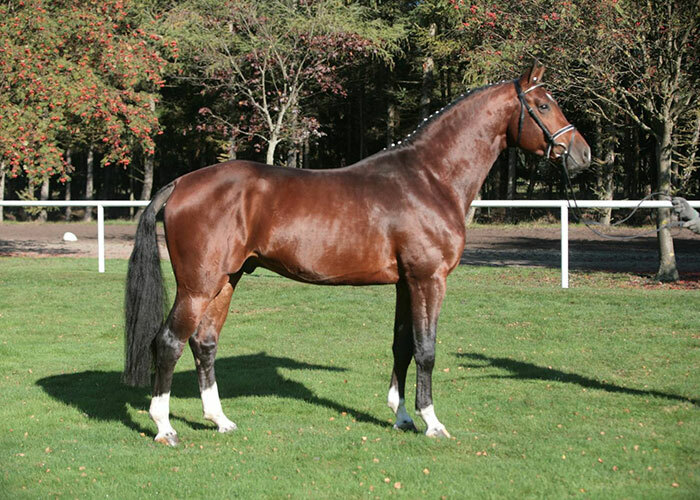 Espri is a stallion that has great dressage ability, plus strong hind quarter development, which gives him tremendous jumping ability also. Espri is a middle framed, correct stallion with an excellent croup. He has energetic, cadenced movements, and a superb disposition. He improves on his foals very much in conformation and type, and he passes on great energy. Espri is known for giving his foals both outstanding movements and remarkable jumping capacities. Even with mares that carry hardly any jumping capacity in their genes he was able to produce show jumpers of superb quality such as the participant of the German show jumper championships Enrika. His most famous offspring ET, was winner of the jumping Derby 1995 and winner of the Volvo World Cup finals 1996, and is one of the world’s top jumpers. Another famous son is Explosiv also under Hugo Simon. His son Escudo 1 was winner of his performance test, and Escudo 11 was champion of the licensing at Verden 1994, and winner of the title ‘stallion of the year 1995′. He is a big improver in riding type and conformation in his progeny and in jumping.